Trizbort.io | Trizbort.io is open-source adventure game mapping and code generation software based on the Trizbort desktop app by genstein and Jason Lautzenheiser. Map and design adventure games in your browser. Trizbort.io is a browser-based tool that lets you easily map adventure games. Drag rooms into your map and link them up using connections in all compass directions. Add a list of objects present in each room. Finally, export your map straight to your adventure game toolkit of choice: TADS, Inform, Quest or Alan. Trizbort.io lets you edit the properties of your rooms using a quick and intuitive editor. Room name and description, room colors, room borders, elliptical or octagonal rooms - we got it. Add named objects with descriptions to your rooms, and even create containment relationships - which will be included in your code generation later. description = "An old-fashioned oil lamp. Trizbort.io can export your map to various adventure game development system. It supports TADS, Inform, Quest and Alan, among others. Code is generated for your rooms, connections and objects, and you can feed it straight into your compiler. The Hobbit (1982) was an adventure game that influenced the genre in many ways. It attempted to give game characters a degree of articifial intelligence. They could roam through the world freely, and even attack each other, sometimes leading to the game becoming unwinnable. The map to one of the most famous games in text adventure gaming history, The Hitchhiker’s Guide to the Galaxy, is now available as a Trizbort.io sample map. Trizbort.io wouldn’t be an adventure game mapping package if it didn’t include a full map of the colossal cave. Trizbort.io is now able to export maps to high-quality .PNG format. As a sample, @john_metcalf’s map for Castle of Doom (ZX Spectrum 48K, Giant Byte, 1986) follows. This map was drawn in five minutes, then the “Obsidian” theme was applied to prettify it. Castle of Doom is a dark game, after all! Trizbort.io now supports themes. 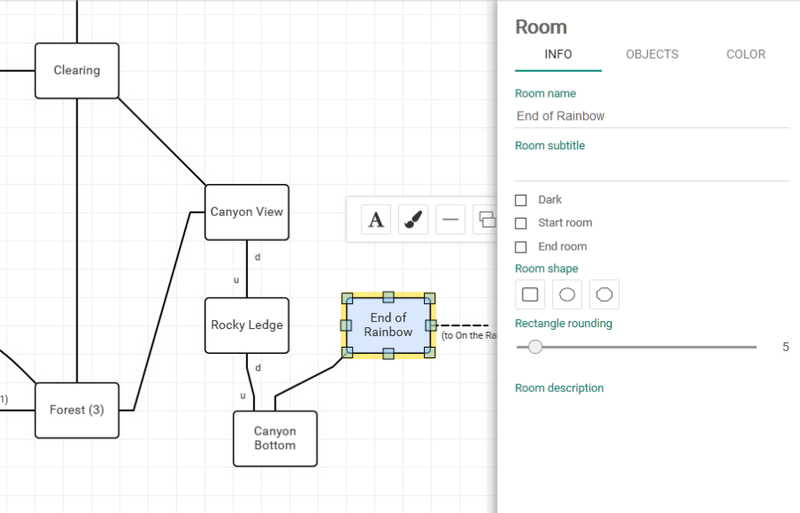 Not only can you set fills, borders, text colors for rooms, notes and blocks, set colors for connector lines and text, but you can also apply a complete set of colors and settings in one go (a theme). At this point, we have the “default” theme - it’s the default, as you might have guessed - and the obsidian theme, which is a cool name for really dark. Trizbort.io can now generate code for the Alan (both versions 2 and 3) and Quest adventure design systems, complete with rooms, connections and objects. The resulting code is ready for compilation with Alan, and can be imported straight into the Quest editor. Trizbort.io can now export maps to Inform 7 format. It can deal with rooms and connections - even in cases where the connection is angled, .e.g. going west takes you from A to B, but from B you need to go north to get to A. Work is in progress on one-way connections and objects. 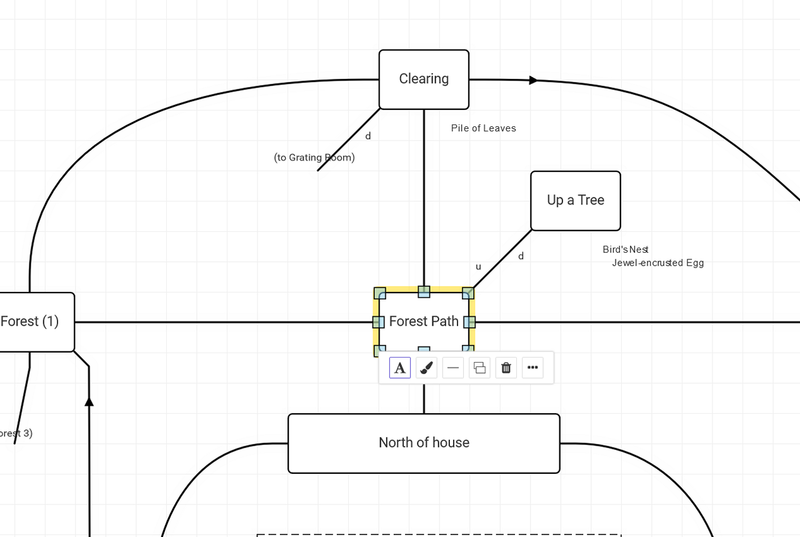 A good test case for Trizbort.io is drawing up a map of Zork. The original map contains lots of ideosyncracies for map drawing: angled connections, (nested) objects in the rooms, one-way passages, connectors that lead off the map, and a shaded block around the White House. Trizbort.io is now able to export your map straight to TADS .t format. The export includes rooms, connections and objects in the rooms. Notes and blocks play no role in TADS (or any other adventure design system). Under the hood, Handlebars templates are used to generate all the code, which makes it simple to add additional code generators (with an understanding of the language involved first). Trizbort.io is open-source adventure game mapping and code generation software based on the Trizbort desktop app by genstein and Jason Lautzenheiser.